There are many advancements that are changing how people search for things online today – especially when searching for local businesses. One of the biggest changes is that mobile internet use now surpasses desktop use today. At the same time, voice-powered digital assistants are steadily growing too. According to several studies about one-third of all these Google searches are related to location. In fact, Google said, “The ‘near me’ intent is a ‘near you’ opportunity.” This is because local search offers a huge opportunity that businesses can’t afford to miss out on. 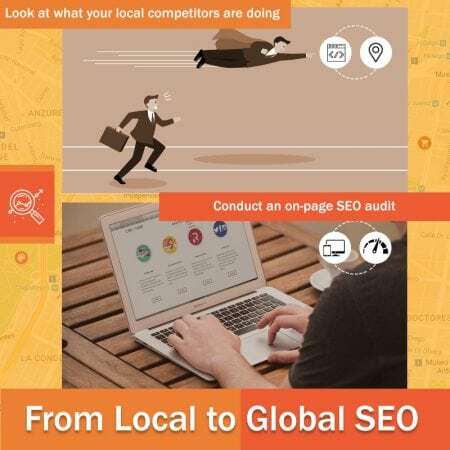 With this in mind, you’ll want to optimize your website for local SEO. Take a look at where your website is now. You can use SE Ranking to get information about your mobile and desktop rankings in regards to competition, search volume, your website’s visibility, and how much you should bid in AdWords. This will also track your organic and paid keyword rankings in regards to your location. Look at what your local competitors are doing. This shows you what their strengths and weaknesses are so you can use them as you improve your own marketing plan. You can use SE Ranking’s SEO/PPC Research tool to see how they’re driving organic and acquired traffic, see what their ads look like, take note of what keywords they’re using, and understand what type of rankings they’re receiving from their organic efforts. Not only is it possible for you to see what they’ve done in their history so you don’t make the same mistakes they did but you can also see how they’ve succeeded so you can do these things too. Researching semantic core keywords is the foundation of your local SEO campaign since this can bring you a lot of traffic. Geo-modifiers (e.g. locations, cities, place names, etc.) help your website rank better. Each month you should check on what keywords and phrases were most popular. When using SE Ranking you can create a report that filters keywords based on parameters (e.g. competition, volume, cost per click). Once you’ve gathered all of your information together, it’s time to create reports that analyze how well your website is optimized. Doing so will help you decide what pages you still need to create for your website to do well in the SERPs. Conducting an on-page SEO audit will also help you uncover any other issues you need to address so you can meet your goals. You should take things like unique content and technical issues into consideration here. Once you have a list of what’s wrong, a good audit will also tell you how to fix these things. This will help you build creative marketing campaigns and strategies, especially when using paid customer acquisition channels such as AdWords. Marketers realize this is great news because making optimization mistakes can be quite costly. This is a major job that you simply can’t afford to overlook. Local SEO really is a major game changer which is why you should hire a company who can do this work for you. One company whom you can trust is Local SEO Tampa Company. We have a lot of experience helping businesses execute a successful strategy and we’re looking forward to helping you too.